Tofu cubes coated in a thick and spicy peanut satay sauce – entirely plant based using aromatic spices in place of red curry paste. 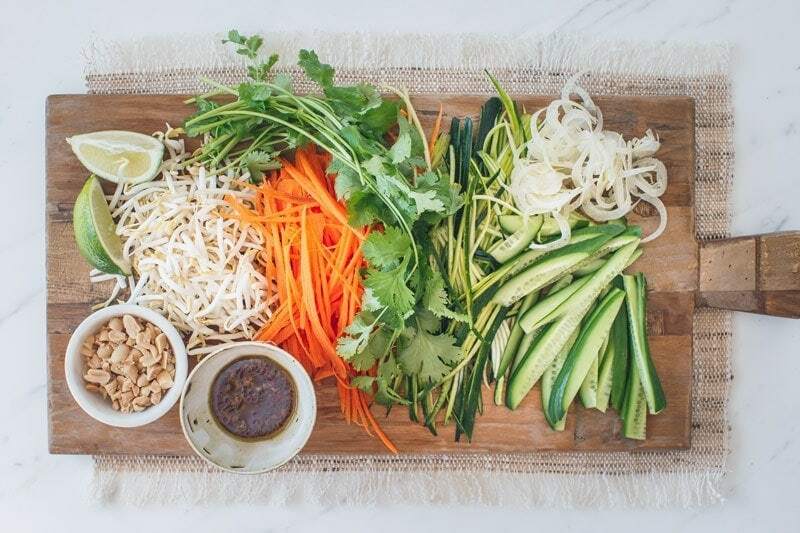 Pair this with a crisp raw Thai salad and a zingy dressing, and you’ve got one deliciously healthy meal. 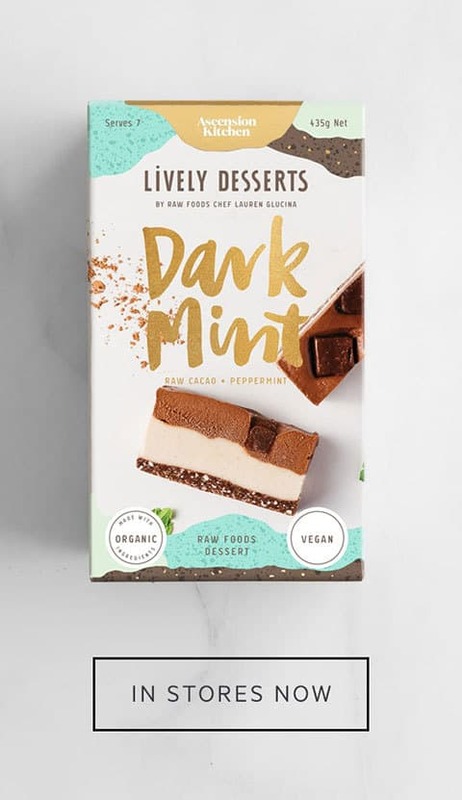 Honestly I could live off a pretty simple diet of whole foods with minimal sauces/dressings – I prefer my food light like this and can appreciate the full flavour of good produce. But living with a meat-and-cheese-eating wine-loving Croatian man – not gonna happen. In order to find a happy medium, and prevent him sneaking off down the road for yet another pizza with all the toppings, hearty and flavour-packed meals are where it’s at. 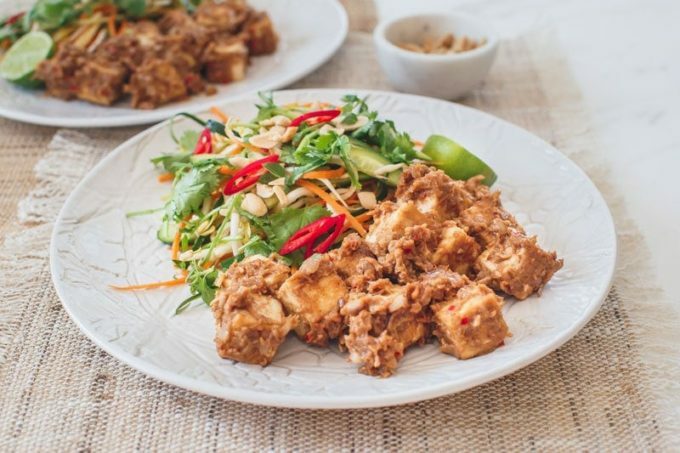 This tofu satay recipe caters to us both just perfectly: the satay – rich, thick, fragrant, sweet, spicy, tangy. The ‘Life Force Salad’ (I know, I’m such a fairy sometimes) – colourful, light, antioxidant packed, and tossed with a killer dressing. Big ticks from us both all round. 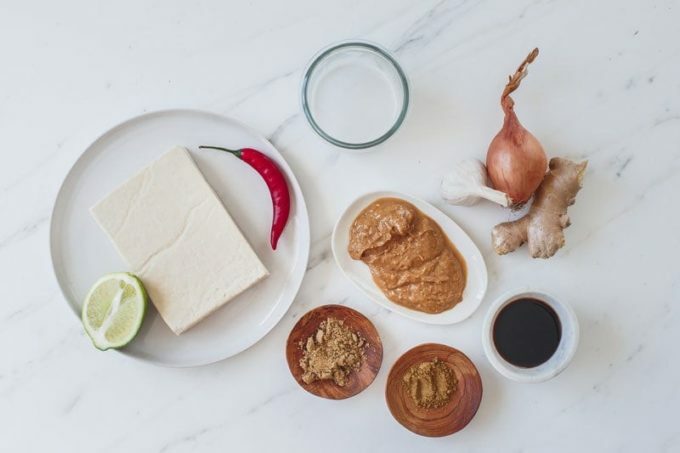 A satay sauce is typically made with peanut butter, coconut milk, sugar, red curry paste and fish sauce. Coriander and cumin powder in place of red curry paste. Why? Because both are key spices in red curry paste, and this way we get all of the flavour without the shrimp it typically contains! 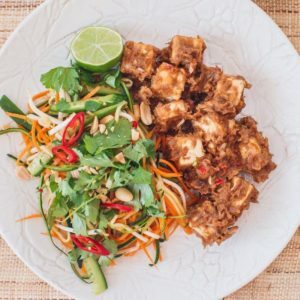 Add a bit of chilli, garlic and ginger, and a squeeze of fresh lime to your peanut and coconut base, and you’ve got one epic sauce right there! Raw carrot, zucchini, fennel and cucumber are all jam packed with phytonutrients and enzymes – the best way to enjoy your vege! 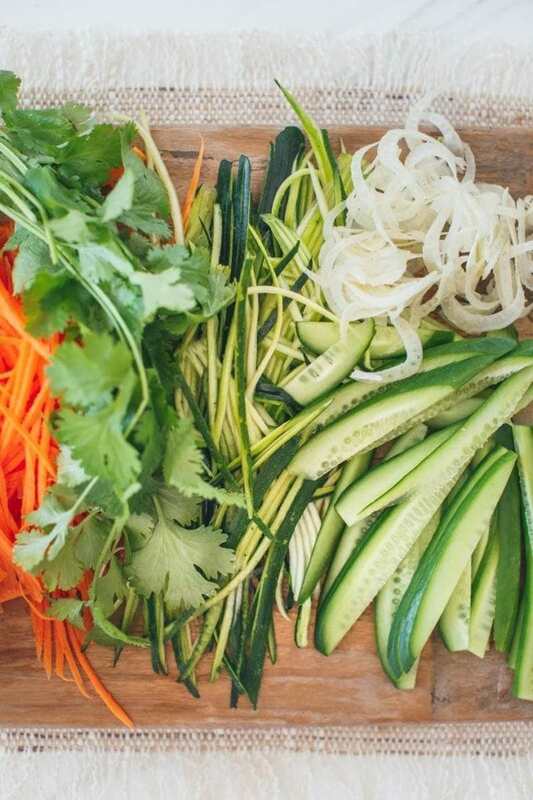 The key to creating a visually impressive raw salad is to make use of a julienne peeler – they’re not too expensive and will quickly shred your vegetables into perfect ribbons – Master Chef style! Because the tofu satay is quite rich, I think nutritionally it is best to stick with a heaping plate full of vegetables rather than opting for rice. You’ll be able to whip this dish up within 30 minutes, and you’ll have enough for two generous mains or three smaller meals. 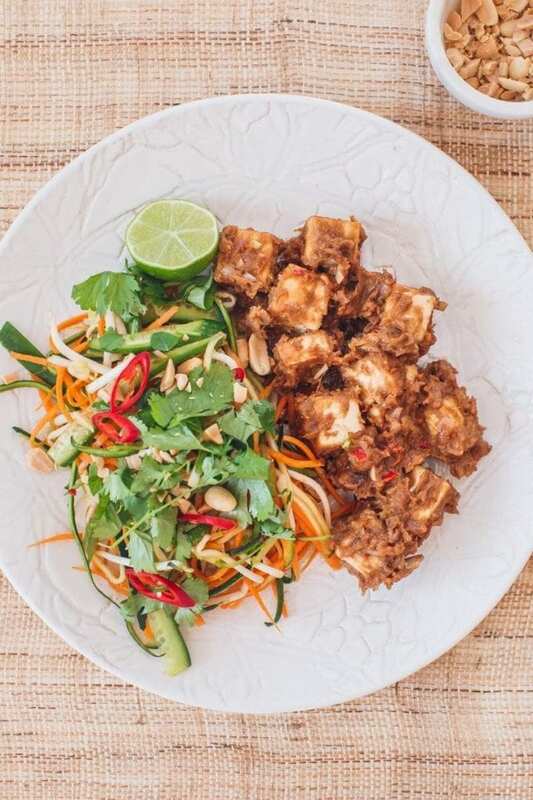 Tofu in a lush spicy peanut satay sauce with a fresh raw salad and tangy dressing – done in 30 minutes and super satisfying. Will serve two as a generous main or three smaller portions (ie serves two with leftovers). 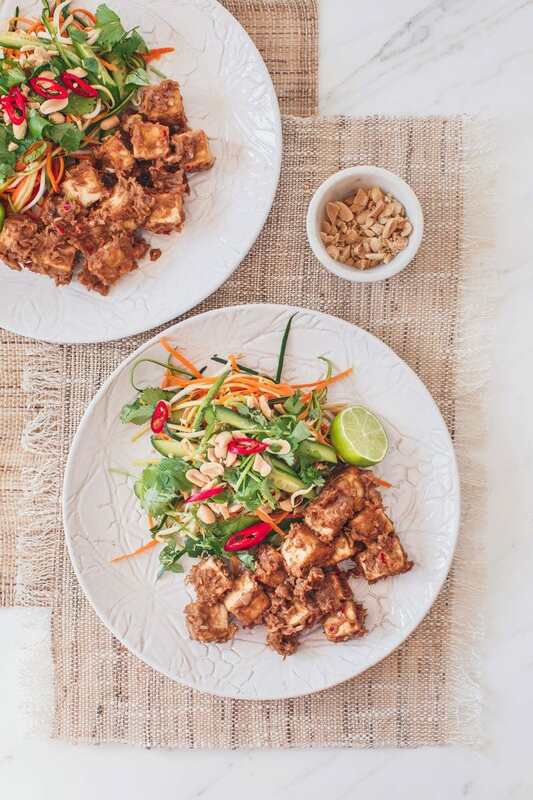 Remove tofu from packet, pat dry with a paper towel and cut into cubes. Heat a small drizzle of olive oil in a pan (low-medium heat) and cook the tofu on all sides till golden. Set aside. Add another light drizzle of oil if needed, then fry shallot till golden. Add garlic, ginger, chilli and cook a few minutes. Add spices and cook till fragrant. Add maple, vinegar and tamari, followed by the peanut butter and coconut milk. Stir well to soften and combine. Remove from heat, squeeze in the juice of half a lime, add tofu back into the pan and toss to coat, then serve with a raw salad. Use a julienne peeler to shred the carrot and zucchini, and finely slice the fennel bulb. Rinse mung beans and spin dry. Top and tail the cucumber and slice into thin strips. Combine all ingredients in a salad bowl and toss to combine. Add all ingredients to a jar and whisk well to combine. 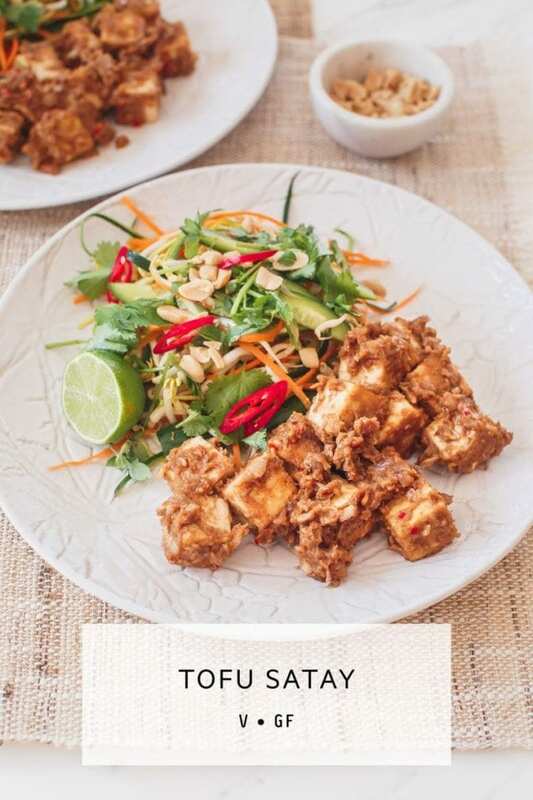 Drizzle over the salad and serve with the tofu satay. You may like to decorate the salad with fresh torn coriander and crushed peanuts.